Sometimes, I have mere minutes to get a meal done and have it be healthy lately. Our gaming, work, house hunting, and work out schedules are getting crazy! This is a side dish that I love and I especially love how easy it is. If you can boil water you are 50 percent there. It’s inspired from a dish I had in this absolutely delicious Moroccan place I ran across. By no means is it authentic but I can’t resist how easy it is. I do all sorts of variations on this and it really is a meal saver. Combine the ingredients in a 2 cup measuring cup. Boil the water and add to the measuring cup mixture until you reach the 1 1/2 cup mark. Allow to sit for atleast 5 minutes. Fluff and serve! See? Just two steps. Easy and delicious! I love serving this with a nice chicken breast with middle east spices and salad. This serves two generously. Each serving contains 213 calories, .8 gram of fat, 47.9 grams of carbs, 2.2 grams of fibre, and 6.1 grams of protein. Takes about 10 minutes, how can you lose? 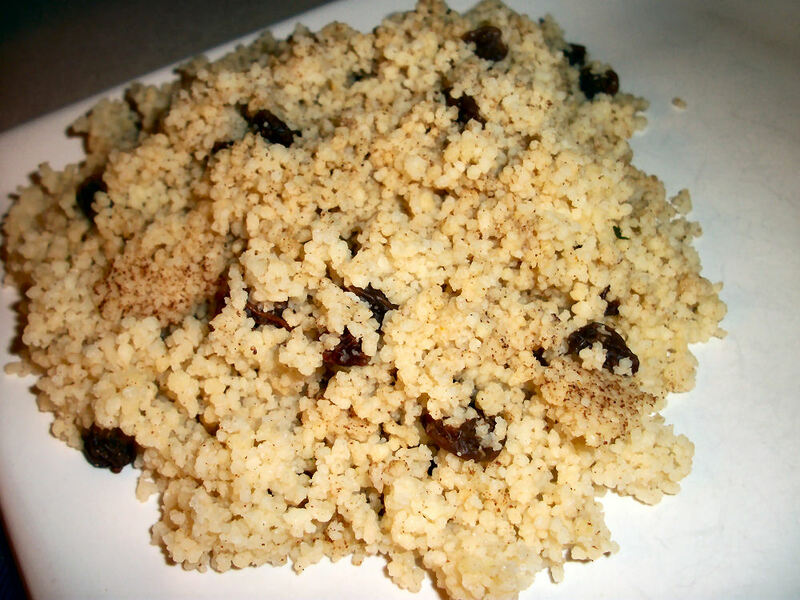 This entry was posted in Sidedish and tagged Cinnamon, couscous, Raisins. Bookmark the permalink.